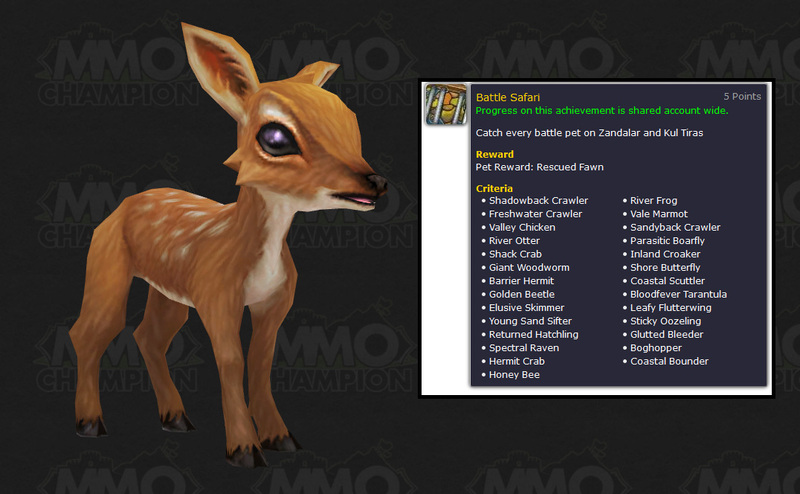 Battle Safari Catch every battle pet on Zandalar and Kul Tiras. Rewards Rescued Fawn. Master of Minions Collect 1000 unique pets. Rewards Hearthy. 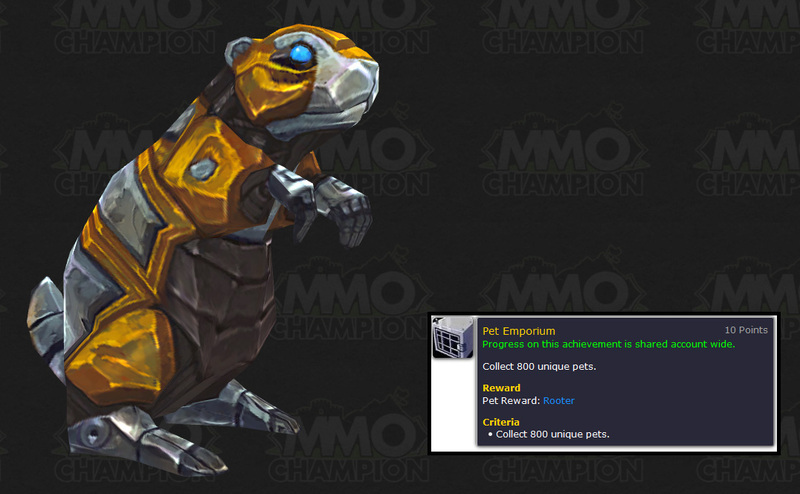 Pet Emporium Collect 800 unique pets. Rewards Rooter. Glory of the Uldir Raider Complete the Uldir raid achievements listed below. 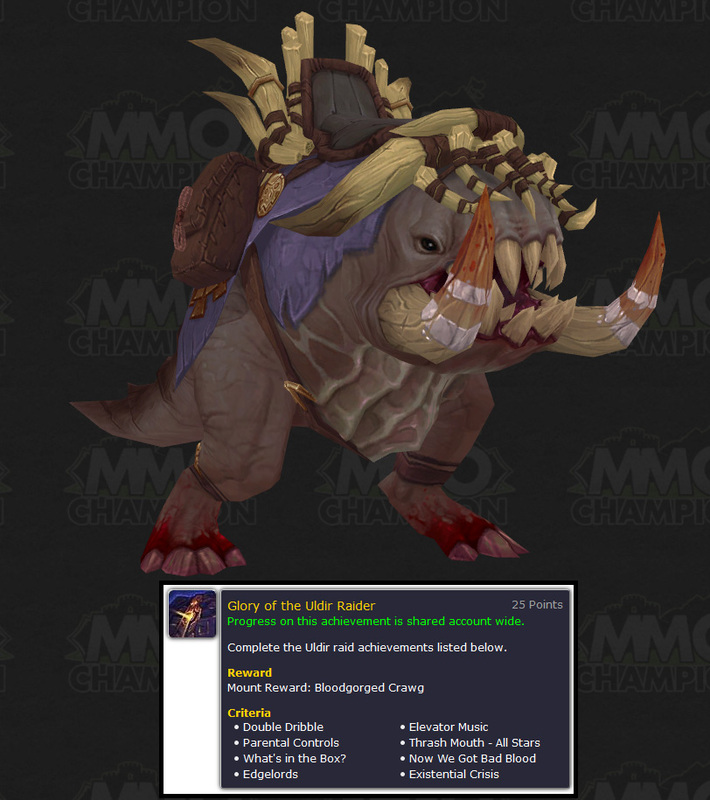 Rewards Bloodgorged Crawg mount. Glory of the Wartorn Hero Complete the Battle for Azeroth Mythic dungeon achievements. 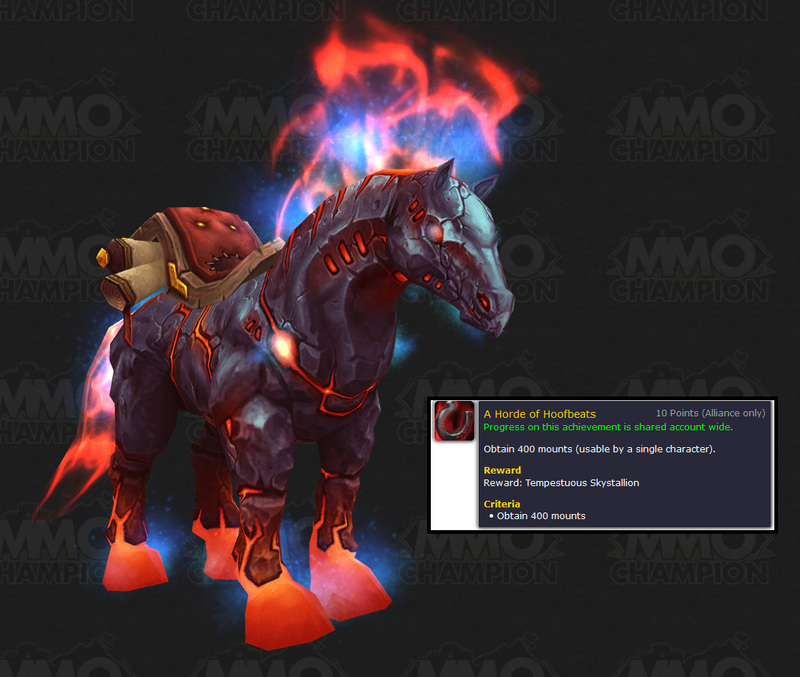 Rewards Reins of the Obsidian Kroluskmount. 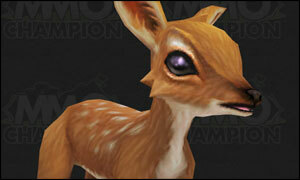 No Stable Big Enough Obtain 350 mounts (usable by a single character). 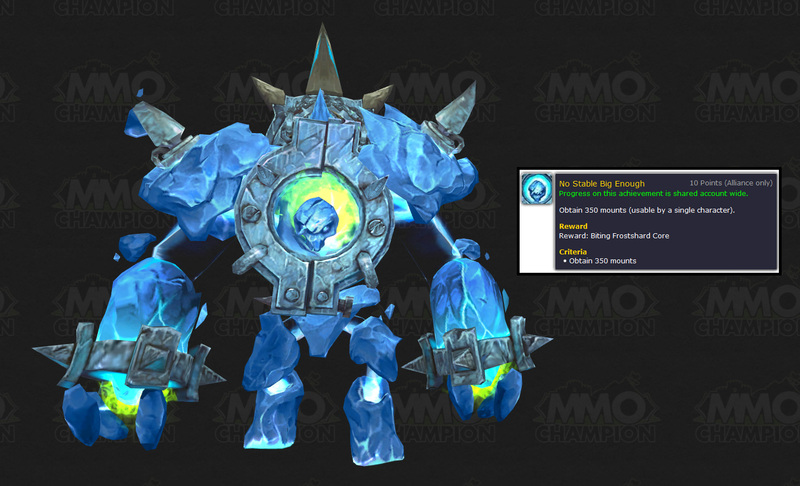 Rewards Biting Frostshard Core mount. A Horde of Hoofbeats Obtain 400 mounts (usable by a single character). Rewards Tempestuous Skystallion mount. 100 Exalted Reputations Raise 100 reputations to Exalted. Rewards the title: Esteemed. 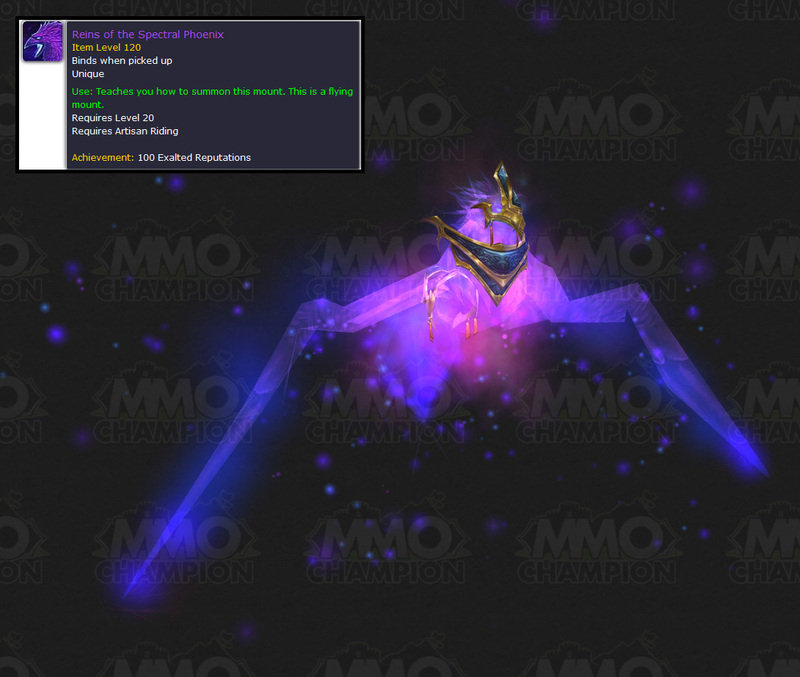 Reins of the Spectral Phoenix is also listed as a reward from this achievement. 80 Exalted Reputations Raise 80 reputations to Exalted. Rewards the title: The Admired. Toybox Tycoon Collect 400 toys. Rewards Brutus pet. 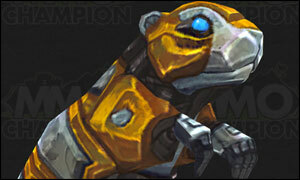 Conqueror of Azeroth Complete the World PvP achievements listed below. World PVP Meta achievement that rewards the title: Conqueror of Azeroth. 20 points. Dueling Master Win 50 duels in the Dueler's Guild. 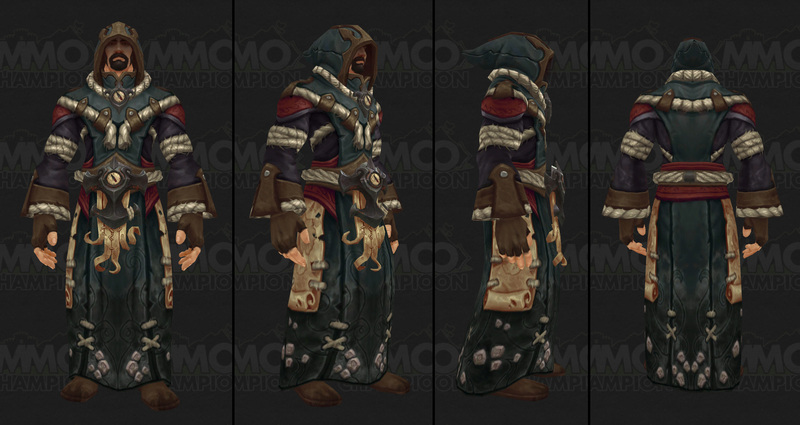 Rewards Dueler's Tabard. Master of Duels Complete the following Dueler's Guild achievements listed below. Rewards character title: Contender. 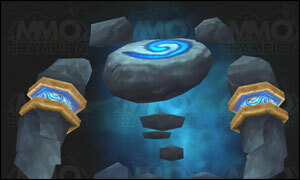 You can see the full list of new items on the WoWDB Beta site. This is hands down the best new item in this build. We don't know where it comes from, but don't get wound up, just hang around long enough and we'll eventually find out! Greatfather Winter's Hearthstone - "Return home in the most festive way possible!" Headless Horseman's Hearthstone - "Return home in the spookiest way possible!" Bloody Apple - You want to bite the apple, but you know there may be consequences. Net-o-Matic 5000 - Dismount other War Mode flagged players. 100 yd range! Conch of Wa'mundi - Summon a Great Sea colossus to carry you to a distant shore. Only useable while swimming in deep water. 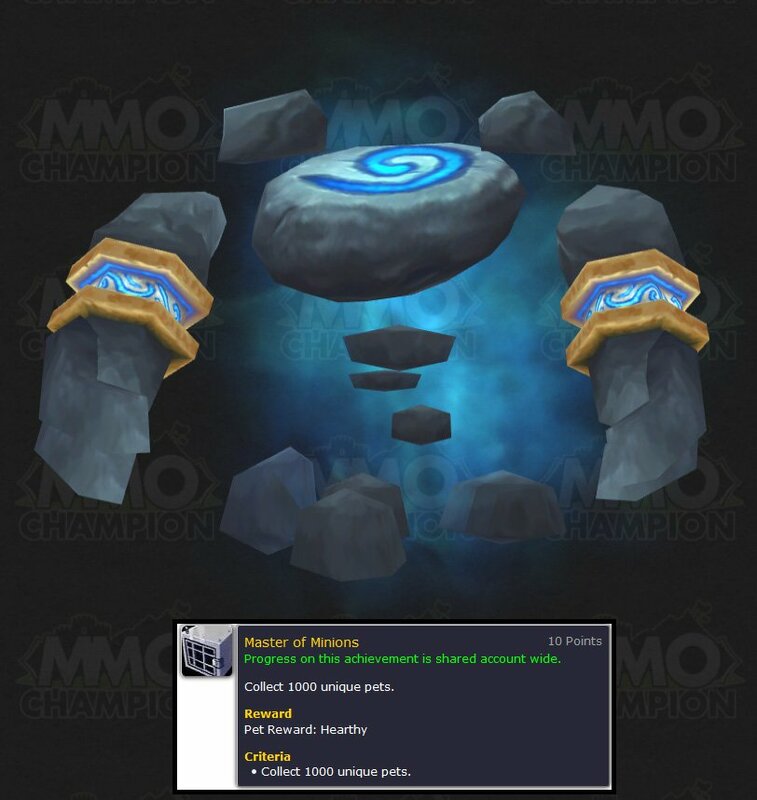 Azeroth's Tear - Magni would be interested in this item. 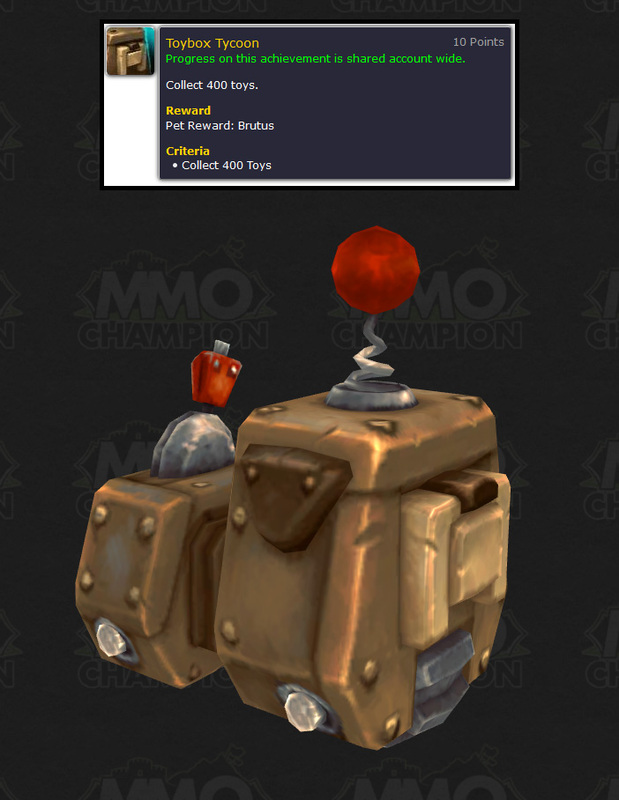 Hypersensitive Azeritometer Sensor - This sensor, when integrated into a device, is capable of detecting event trace amounts of Azerite several yards beneath the ground. Can be bought and sold at vendors. Some reputation reward toys were added in this build. Gnoll Targetting Barrel - Summon an Gnoll Target Barrel at the target location for 5 min. The barrel acts as a target dummy while it persists. Only usable outdoors in Kul Tiras. Honored, 1500 gold. Cursed Spyglass - Look into the distance and see what the scurvy naves are up to, yarr! Revered, 1000 gold. Weary Spirit Binding - Returns you and your spirit to . Speak to an Innkeeper in a different place to change where your spirit calls home. - Revered, 1000 gold. Party Totem - Get the mojo flowing. Zandalari Empire - Revered, 1000 gold. Akunda's Firesticks - Prepare a campfire and use Akunda's Firesticks to get a spark. The fire increases the versatility of those nearby by 4 and allows cooking. Honored, 1500 gold. Vulpera Battle Banner - Drop a banner into the corpses of all the Voldunai's enemies. Honored, 1500 gold. Ghostly Explorer's Skull - Place the skull on the ground so it can see the cool place you are at. Revered, 1000 gold. Vulpera Scrapper's Armor - Equip your own fierce looking helm and banner. Revered, 1000 gold. Toy Armor Set (A) - Winter Veil Reward: A toy helm and cape. Toy Armor Set (H) - Winter Veil Reward: A toy helm and cape. Lots of new mounts were added in this build! Reins of the Mighty Caravan Brutosaur - Purchased from vendor for 5 million gold. Reins of the Palehide Direhorn - Purchased from vendor for 500K gold. Biting Frostshard Core - Collect 350 unique mounts. Tempestuous Skystallion - Collect 400 unique mounts. Chewed-On Reins of the Terrified Pack Mule - Located in Drustvar. Lots of new pets were added in this build, as well as some interesting items. Ghostly Pet Biscuit - Oh no! Has your pet passed beyond the veil? Scroll of Combustible Critters - Read a magic scroll to destroy nearby critters. Copyright © 2016 Unhuman. Community Software by Invision Power Services, Inc.